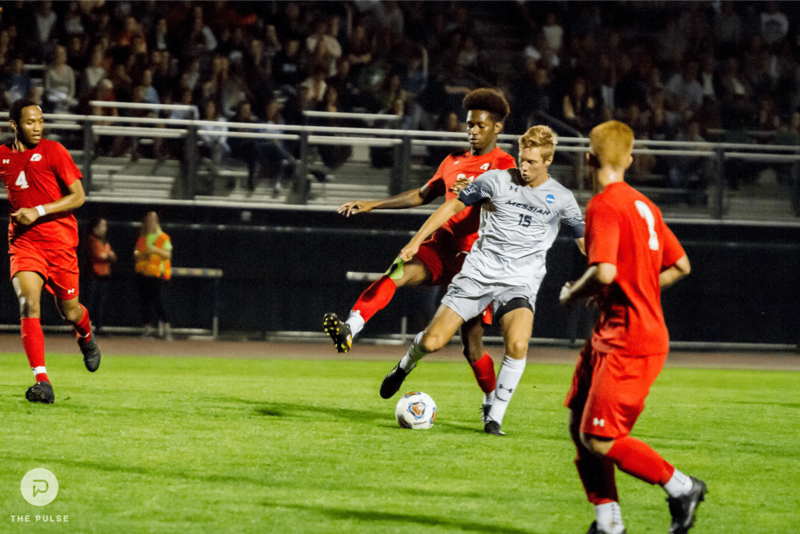 It was a busy week for Messiah Athletic teams. Take a look at what you may have missed. Field Hockey traveled to Gettysburg Wednesday to match up against the Bullets. Two goals in the first half from Kristen Levesque and Jennie Young gave the Falcons a 2-0 lead heading into halftime. Bullets’ Henna Fraiman scored for Gettysburg to make the score 2-1. The score would stand as the Falcons would win their 10th game of the season. The team would stay undefeated (11-0, 3-0) on Saturday, shutting out Albright College 4-0. Kristen Levesque, Shayna Landis, Casie Stief, and Kezia Loht scored for the Falcons. Men’s Soccer took on Johns Hopkins in their first matchup out of three this week. The Falcons tied the Blue Jays 2-2. The Falcons were down 2-0 in the second half before two goals from Nick West, but neither team was able to get the golden goal in OT. The Falcons beat Stevenson on Wednesday. Winning 2-1, the team outshot the Mustangs 23-6. Nick West and Luke Groothoff scored for the Falcons. On Saturday in their Green Out game for Mental Health Awareness Week, the Falcons downed the Albright Lions 4-0 with goals from Lucas Kokolios, Nick West, Luke Groothoff, and Brit Haseltine. The victory marked the 200th win for Head Coach Brad McCarty. Women’s Soccer had two MAC Commonwealth matchups last week. In the first matchup, the women outshot Stevenson 27-0. Sunny Gelnovatch, Brooke Firestone, and Maddie Kohl scored as the Falcons won 3-0. The Falcons were at home against Albright Saturday. Jessie Fisher recorded a goal and an assist in the win. The 2-0 shutout win marked the fourth straight shutout for the Falcons. Men’s Cross Country finished in second place in the DeSales Invitational. Benjamin Schott came in 8th place overall with a time of 26:18.50. Women’s Cross Country came in third against 24 teams in the DeSales Invitational. Sarah Codd led the Falcons coming in 9th overall with a time of 23:18. Women’s Volleyball got back in the winning column against Lycoming College Wednesday night. The Falcons won three straight sets against the Warriors (25-15, 26-24, 26-24). Kate Preudhomme recorded 10 kills and Natalie Marsch recorded 14 digs. Over the weekend, the team traveled to Newport News, Va. for two matches. The Falcons defeated St. Mary’s College 22-25, 25-22, 25-18, 25-18. Mary Underman and Lanae Hunsberger both put up double-digit kill numbers and Amanda Dahlman registered 17 kills. Messiah fell to Christopher Newport 3-0 (25-21, 25-20, 25-16). Katie Wilcox led the team with 12 assists and Jessica Zellers recorded two service aces. Men’s Soccer @ Lebanon Valley College 4:00 p.m.
Women’s Volleyball @ Albright College 7:00 p.m.
Field Hockey @ Christopher Newport University 4:00 p.m.
Women’s Soccer @ Lebanon Valley College 4:00 p.m.
Field Hockey @ Alvernia University 4:30 p.m.
Women’s Cross Country- Connecticut College Invitational 11:00 a.m.
Men’s Cross Country- Connecticut College Invitational 12:00 p.m.
Women’s Volleyball @ Randolph- Macon College 2:00 p.m.
Women’s Soccer @ Alvernia University 4:00 p.m.
Men’s Soccer @ Alvernia University 4:00 p.m.